The Friederich Seyler family of Switzerland came to America around 1752. Descendants of Friederich have provided Y DNA tests and many other Saylor men have found they are a very close match. Much is known about this family. This page is devoted to identifying other Seiler families from the same village as more than one came to America. Thanks to Jack Saylor of South Bend, IN, who initially sent me a package of information on this family in 1998 and made me aware of this Swiss-USA connection. And thanks to Alan Albright who in 2015 found Swiss records on line and has been confirming, expanding and questioning what has been written about this family. Also, thanks to Breanna Perez for information on John Ulrich Sailor. Friederich Seiler or Seÿler, the son of Theodore Seiler of Bottmingen, was baptized in Binningen, Switzerland and married and had children there. Around 1752 he and his family came to America. The spelling of the surname has evolved. It is Seiler in the baptism records of Friederich and his siblings, then Seÿler when Friederich has his children baptized. In America it became Sailor and then Saylor/Sayler. Bottmingen and Binningen are Swiss geographic names associated with the early records of this family. Bottmingen is about a square mile and until 1837 was part of Binningen which is less than 2 square miles. The church where the records were made is in Binningen. These were small villages near Basel and over time became part of the city of Basel, Switzerland. Basel and its suburbs are in the canton of Basel-Stadt. Bottmingen and Binningen are on the Birsig River which enters the Rhine River at Basel. This is an important connection as it is the Rhine that was the gateway for many Swiss and Palatine protestant settlers to make their way to America in the 1700's. A number of Seiler/Saylor families were part of this migration. Friederich Seyler and his family came to America around 1752. Researchers are fortunate to be able to connect the records in Basel with the the land records in western Pennsylvania. Jack Saylor, a descendant of Friederich, provided his Y-DNA a few years back and many other Saylor men have found their DNA to be a very close match. See groups 3 and 4 in the Saylor Y-DNA Project. It is probable that a few other "Seiler cousins" of Friederich from the Binningen area came to America, all sharing the same Y DNA. In 2011, my wife and I visited Bottmingen and Binningen in Basel, Switzerland. The St Margarthen reformed church in Binningen has survived and is the church associated with the Binningen protestant records that are referred to below. 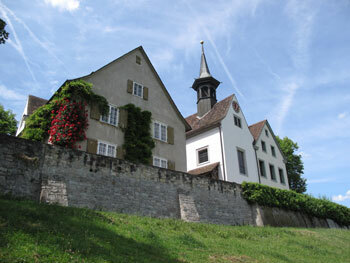 Seiler baptisms are also found in two other nearby church records; St Arbogast in Muttenz and St Elisabethen in Basel. See this interesting Wikipedia page on the Seyler family. Switzerland was alarmed at the loss of families to America and enacted laws to control migration. Families had to pay a "manumission tax" to gain their freedom to legally migrate. The book, "Lists of Swiss Emigrants In The Eighteenth Century To The American Colonies" by Faust and Brumbaugh in the 1920's, examined the manumission, church and other records and provided accounts for various families. The book tells of a number of Seiler families who came to America; one being, Fridlin (Friederich) Seyler, the son of Theodore, deceased, and his wife Anna Catharina Spaar, a widow, and their three children. It is useful to present here what Faust and Brumbaugh wrote about this family because for most researchers this book was the major source of information until Swiss records started to be put on line. The text below is a transcription of pages 167-8 from the above book. Fridlin Seyler, Manumission Records [KB] Friederich, son of Theodor, deceased. Anna Catharina Spaar, Sparr, his wife. Several entries in the Records of the Small Council, [RP], (125, 271, 299 and 342) show that the Council occupied itself repeatedly with his clandestine and fraudulent emigration. Nevertheless his three sons obtained in 1770 (RP 143, 80) the release of their property and their manumission. The entry in the Manumissions Register, [MP] is as follows: Matthias, Ulrich and Hans Jacob Seyler, legitimate sons of Fridlin Sailer and Catharina Sparr of Botmingen, who have settled in Pennsylvania, have been manumitted together with their still living mother, who is also staying with them, by Our Gracious Lords March 28, 1770. Their property consisted of 572 pounds on which 'Herr Landvogt' on Munchenstein has collected the ten percent tax. At that time the sons were all married and located in Carlisle, Pa., the one being a tinner, the other a locksmith and the third a saddler. Their step­brother Leonhard Low, whom we meet in 1763, seems to have emigrated with them in 1752 and gone back to live in the Canton of Basel once more until 1763. His father, of whom his pastor says in KB that he was a fine man, died ten days after his birth. His mother married Fridlin Seyler, emigrant of 1752, and seems to have taken him along to America without being able to prevail on him to stay there, About the time of his second emigration he was talking however so much about America in his community that the Landvogt urged the Council to grant his request because he feared that his further presence might do more harm than good (Emigration A, [AA], Letter of March 29, 1763). Recently, the films of some of the original Swiss documents have been put on line by the Staatsarchiv Basel Landschaft and researchers can dig for more detail. Use the English translation page facility to find your way around this large site. This is the main genealogy page and the Binningen films are here. Also some Swiss films are on line at Family.org. Thanks to Alan Albright for starting all this research below and his willingness to have it shared here. Looks like fl = ? Looks like Pl = ? Theodor Seiler was baptized 30 Mar 1662 in Binningen, Switzerland. Theodor is stated as deceased in 1752 in the manumission records of his son Friederich. On 6 Nov 1699, Theodor Seiler married Miss Maria Schweighauser, both of Bottmingen [Page 302, image 272]. Friedrich, bap 12 Mar 1702, father, Theodor Seiler von Bottmingen, mother, Maria Schweigerhauser, witnesses: fl? Johann Rudolf Genath, councillor, Friederich Jundt, Miss Margaret Schweighauser. [page 125, image 129] Came to America c1752. See more on him in section 4 below. Margareth, bap 29 Dec 1709, father, Theodor Seiler von Bottmingen, mother, Maria Schweigerhauser, witnesses: Hans Heinrich Schweighauser, Margaret Böhler, Miss Barbara Seiler. [page 147, image 151]. Died abt 1774, Berkeley County, WV. Source: Protestant Parish Records 1597-1719, Binningen, St Margarthen Church, Basel, State Archive Basel County, E9.1.10.10 Binningen 2, found and transcribed by Alan Albright, 2015. See other Binningen film links here. Spouse, Margreth Schwartz, baptized 20 Apr 1657 in Basel, Switzerland. Death 1 Nov 1727 in Basel, Switzerland. Her parents Leonhard Schwartz Birth abt 1625 wife Ursula Meyer Birth abt 1630. Jakob Schweighauser, baptized 21 May 1598 in Basel, Switzerland. Death abt 1667 in Basel, Switzerland. Spouse, Anna Burin, baptized 30 Apr 1598 in Basel, Switzerland. Death 18 Jul 1677 in Basel, Switzerland. Alan writes, "This register has the best records I have ever seen. This Pastor deserves a big kudos for writing so legibly. The Schweighauser's are in these records. There are Seylers listed don't know to this point if they are related. Ulrich Schweighauser is believed to be one of the earlier ancestor to Maria who married Theodore. Maria b-1668 then Simon b-1644 (married Margareth Schwartz) then Jakob b-1598 (married Anna Bür) then Karl b-1557 (married Anna Hügli) then Ulrich b-abt 1520 (married Brigitta Baulner) then Jakob Schweighauser. Ulrich had about 18 kids but Karl 1557, there wasn't a baptism but it seems there were only 2 listed for 1557 so did they get lost or what? I haven't attached Karl to Ulrich like everybody else until I can get an explanation! But up to Karl has been proved." Alan Albright has compiled the ancestral list below from the Swiss church records. It is greatly appreciated that he is willing to have his hard work presented here. For a while it was incorrectly felt that this family below were the parents of Theordor. Johann Seiler, birth 15 May 1632 in Muttenz, Arlesheim, Basel, Switzerland. Death 11 Jun 1675. His parents Hans Seiler Birth abt 1601. Death Apr 1635 in Muttenz, Arlesheim, Basel, Switzerland. Spouse of Hans was Maria Egarin. Birth abt 1605; her parents Hans Brüderlin Birth abt 1599 wife Maria Mönch. Johann Seiler's spouse, Margreth Brüderlin, birth Apr 1630 in Muttenz, Arlesheim, Basel, Switzerland. Death 25 Sep 1708. They had nine children and a Theodor was the youngest. New research has shown that Theodor Seiler was baptized 30 Mar 1662 in Binningen, and his parents were Friederich (Fridlin) Seiler, bap 26 Oct 1634 in Binningen wife Barbara Seiler married 6 Dec 1658 in Binningen. Friedlin (Friederich) Seiler and Barbara Seiler marriage on 6 Dec 1658 in Binningen, Basel-Landschaft, Switzerland. Children all born in Bottmingen, all baptized in Binningen and all dates are baptism dates. Jakob Seiler, possibly bap 16 Jan 1564 and Barbara Dietler. Sankt. Elisabeth records. 1. Jacob, bap 25 Mar 1597 name could be Jakob, the only witness is a Jakob Held which would make sense! 4. Frederich, bap 13 Nov 1603 name could be Friederich, only witness Friederich Engel which again would make sense! Record from Sankt Margarethen. See more on him below. Friedrich Seiler is the son of Jakob Seiler and Barbara Dietler, bapt. 13.11.1603, bur. 31.10.1676. On 22.10.1670 he was still citizen of Bottmingen, but since 40 years at Basel. He worked as a Pastor 1632 at Jonschwil, Canton Sankt Gallen, 1636 at Kirchberg im Toggenburg, Canton Sankt Gallen, 1638 as a teacher at the Gymansium of Basel and became 1650 the head of this Gymnasium. In 1638 he married Rosina Stöcklin. He had a son Friedrich, a Pastor too, working at Sankt Peter, Basel. Alan provides this link. Barbara Dietler, bap 9 Nov 1580 her father Lienhard Dietler bap 21 Jan 1556 his parents Lienhard Dietler and Klara Hartman his parents Hans Dietler and Verena Gerster. 3. Otilia marries 1541 Luis Thurneysen then in 1568 marries Hans Scherby?? So with a child born 1553 he probably is born before 1533 and died in 1629 would make him 96 at the youngest I am guessing he was born well before that as Ursula would have been born in the teens as if she even got married at 14 she would have been born 1518 more likely born 1512 to 1514. I believe from a logical standpoint that I separate the 2 generations. I believe the death of the Lienhard Dietler in 1629 is the 1556 Lienhard, making him 73 years old at death. Friederich or Fridlin Seyler was baptized 12 Mar 1702, father, Theodor Seiler von Bottmingen, mother, Maria Schweigerhauser, witnesses: fl? Johann Rudolf Genath, councillor, Friederich Jundt, Miss Margaret Schweighauser. [Binningen 2, page 125, image 129] Friederich came to America around 1752 with his third wife and three children by her, under "fraudulent and clandestine" circumstances without permission from the Council. It may be possible that some of his older children came as well. Friederich died before 1770 in Carlisle, Cumberland Co., Pa. His surname of Seiler/Seyler became Sailor/Saylor. Alan Albright has been working on the Swiss registers and has concluded that Friederich had three marriages. First to Anna Rapp (1721), second to her sister Elizabeth Rapp (1725) and third to Anna Catharina Spaar (1734). Below are the records to support this conclusion. Alan has been aided by a Swiss cousin, Ernst, who is able to decifer the records and provide a more complete transcription. Alan writes, "that the Friederich baptism clearly shows the name Friederich not Fridlin. The name is spelled Fridlin Seyler in the Kirchenbucher Parish Register showing the baptismal dates. However, the Manumission Register spells the name Fridlin Sailer." Friederich Seiler marries Anna Rapp on 12 May 1721; Friedrich Seiler of Bottmingen & Miss Anna Rapp, the Councilmans daughter of Binningen [image 8, entry 38, Binningen 3]. Anna was baptized, 4 May 1690, parents Antonius Rapp, the cooper of Binningen & Elisabeth Jundt [image 101, Binningen 2]. Hans Jakob, bap 11 Jul 1723 Hans Jakob - Friederich Seiler and Anna Rapp [image 99, entry 111, Binningen 3] Note: witness Katharina Rapp of Binningen could be a sister to Anna. Friederich Seiler & Elsbeth Rapp 5 Mar 1725 it looks like it says Theodor's son? Ursula baptized 26 Feb 1730 parents Friedrich Seiler, son of Theodor, of Binningen & Elisabeth Rapp, witnesses: Johannes Jundt of Bottmingen & Anna Seiler & Ursula Obmann of Binningen. [image 126, entry 313, Binningen 3] Alan thinks she dies but not sure on death. [image 291, entry 340, Binningen 3]. This from Ernst - 5 Mar 1730 little Ursula dies 10 days old. [image 290, entry 328, Binningen 3]. These need checking. Elisabeth Rapp dies in 1733. Anna Katherina Spahr was married 1st to Emanuel Löw. Emanuel Löw lived at Holee, still a part of Binningen today. 18.07.1730 - death of Friedrich Seiler of Bottmingen, late husband of Ursula Stahl - age 61. This Friedrich was born around 1669 and the name of his widow doesn't fit. Also on Totes Alan sees a Friederich Seyler that looks like the husband of Ursula Rapp. Could we have three Friederich Seylers that marry Anna Rapp, Elisabeth Rapp, and Ursula Rapp? 15 Oct 1721, Theodor Seiler, young son of Friedrich the herdsman/shepherd of Bottmingen. [image 275, entry 49, Binningen 3] This Theodor Seiler died too soon to be my Theodor b-abt 1670; it just doesn't seem Theodor was a widely used name in the Seilers except in that particular Seiler line. For me there are at least two different Friedrichs at Bottmingen. Since Friederich son of Theodor is witness to Friederich the Herdmans on a blessing we can know their not the same person. The note about Anna being the daughter of Councilman Rapp of Binningen is important because as Ernst states, "to find her parents and a daughter of a councilman would probably never marry a shepherd named Friedrich Seiler." Anna Rapp's father was a cooper. Ernst writes, "It's an old tradition in Switzerland that tasks like Judges, Coucilmen or others are done by persons elected by the population. These men (in those days) were well known and respected in the community. It is always a part time job and they keep their normal occupation." image 92 entry 58 Carl-Friederich Seiler and Elisabeth ??? In 1769-1770 Jacob Schaffner, a storekeeper in Lebanon (PA), re­turned to Switzerland and succeeded in collecting the inheritance of the "Seyler Boys". The date of their Manumission and release of their property is recorded as March 28, 1770. At this time the record shows that they are living in Carlisle, PA. All are married, their father deceased and their mother living with them. One is a tinner, one a locksmith, and the third is a saddler. It should be noted at this point that the name "Hans" is often translated to John or Johann and the name "Matthies" is trans­lated to Matthew. Baptized: #548 Matthias, father Friederich Seÿlor, 16 Dec 1738 in Binningen, Switzerland. 4 John Sailor Born: 10-Oct-1769 in: Cumberland Co. Pa, Died: 05-Oct-l 828 in: Mechanicsburg, Cumberland Co. PA. By will dated May 8, 1828, John Sailor left a tract of land to his three grandsons, John Sailor, George Sailor, and Mathias Sailor. In Dec 2016 I heard from Deanna Perez, a descendant of a John Sailor whose children, for the most part, match those below for John Ulrich Sailor. Her John Sailor died c1801-1802 because Elizabeth came with her children and to Bath Co, KY. In 1810 she is in Montgomery Co, KY with one male 15-25, and 16-28 and 5 kids under 16. So we have some unaccounted for kids. Source: "United States Census, 1810," Montgomery, Kentucky, p. 354, FHL microfilm 181,352. Also, she is alone when she signs for the marriage of daughter Sarah Sally Saylor's marriage to Samuel Allen Cobb on 27 Oct 1811 in Fleming, KY. It says mother Elizabeth Saylor. Guardian is John Minear and he is bondsman. Deanna assumes that the Saylor and Minears were friends in St George now Tucker Co, WV and that some of the minor kids of John Saylor probably needed a guardian appointed. Samuel and Sally Saylor had 10 children. Deanna has concluded that her John Sailor is the same man as John Ulrich Sailor who was born in 1743 in Switzerland. Baptism: Hans Ulrich, father Friederich Seÿlor, 7 Jul 1743, Binningen, Switzerland. Baptism: Hans Jacob, father Friederich Seÿlor, 17 Apr 1746, Binningen, Switzerland. Frances (Fannah) Sailor B: 24-Mar-1774 in: Carlisle, Cumberland Co., PA, Died: in: Euclid, Ohio Asa Dille b-11 Sep 1767, married in 1792 she died 18 Dec 1842. Elizabeth Sailor, Born 6 Jan 1786 and Died 21 Apr 1864. married John Sterling they were married 23 Dec 1806. Jacob was commissioned as an Ensign, 4th Company, 2nd Battalion, Cumberland County (PA) Militia per a Battalion Return dated July 11, 1777. Residence is ascribed to Carlisle Twp. He served a tour of active duty in Captain Matthew Gregg's Co. of the 1st Class under Order of Council dated July 20, 1777. In 1790 Jacob & Frances sold their house (Lot #59 on W. Pomfret St.) in Carlisle & moved to Wash. Co. Mar. 20, 1793 obtained warrant for 200 acres in Buffalo Twp. Tract called "Remainder" - Surveyed: 8-19-1808; Patented: 9-20-1808. Ref: Cumberland Co. PA marriages, 1761-1817, compiled by Susan Penrod, pub. by Southwest PA Genealogical Services, P.O. Box 253, Laughlintown, PA 15655, Copyright 1983, page 32. Source: Alan Albright, a descendant of Jacob. The 1780 Tax List shows Jacob Sailor, a tax payer in Carlisle, Cumberland County. A deed is on file in the Cumberland County Courthouse in Carlisle showing the sale of a property on Pomfret Street to Jacob Sailor in 1775. Another deed shows that Jacob Sailor and his wife Francis sold the Pomfret Street property to Adam Cope on January 18, 1790 and moved to Washington County, PA. Witnesses to the deed are Henry Saylor and Matthew Saylor. Source: From The Desk Of: Jack R. Saylor Date: 24 March 1993. I'm the 4th Great Grandson of Hans Jacob Seiler (Crown 1749) and the third Great Grandson of George Michael Seiler (Sayler). We are a close Y DNA match (36/37). In doing research I have concluded that Hans Jacob and Friederick were brothers and Margaret Spahr was a Sister. Theodore was their father. Another brother was Christoffel who also came on the Crown with Jacob and Margaret. Other relatives were on the same ship. A brother-in-law Adam Brodbeck was also there. He was the brother of Jacobs wife Chrishona Brodbeck. They were from Bottmingen , Basel, Switzerland. Jacob came here with his family 1747 on the Crown. The same time as his sister Margaret Seiler Spahr, sister also of Friederich Seiler. Friederich's wife was the sister of Hans Ulrich Spahr. They were from Bottmingen, Basel, Switzerland. George Michael Sayler, Jacob's youngest son, was born 1752 in Cocalico, Lancaster, Pa. I haven't researched their full relationship with the Sayler Boys; but I think they were at least paternal cousins based on our DNA results and the fact that they were all from Binningen, Basel, Switzerland. The above Jacob Seiler lived in Cocolico, Lancaster, Pennsylvania up to the 1770's. I have a release of title to land (from him) he tried to buy in 1750, showing that he was still in Lancaster County and he was also in the tax records (1750-1770). If you notice in the Passenger Lists for Jacob and Christoffel Seiler that an older Lawyer named Matthias was a God Parent and uncle of the children. This is why the name is popular within the later Seiler Families. Source: The above is a combination of content from emails from Wesley from 2009 and also late 2012. There are many Seiler familes in the Bottmingen record. Below is an attempt to identify families and apologies for the poor effort at transcription of many names. Karl and Elisabeth married 2 months after Theodor Seiler and Maria Schweighauser. Could they be brothers and sisters? A Christoffel Seiler came to America. See also Ulrich Seiler on this page 133. Ulrich Seiler, wife Maria ?? [looks like Soup", but isn't] Seiler, wife Clara Rapping? Friderich Seiler, wife Ursula ?? These are from film copied by Alan Albright. More details to follow. 006 Hans Heinrich son of Hans Seiler and Margaret Bruderlin (would it really be Bruder or Bruderl?